"This is a favorite recipe of my late mother-in-law's family, used for all celebrations." In a blender, combine bananas, sugar and 3 cups water. Blend until smooth. 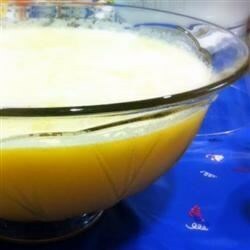 Pour into a large bowl and stir in pineapple juice. Blend in orange juice concentrate, lemonade concentrate and 3 cups water. Divide into 3 plastic containers and freeze until solid. Remove from freezer 3 to 4 hours before serving. Using one portion at a time, place slush in a punch bowl and pour in 1 liter of ginger ale for each. I made this punch for my three year old's birthday party. It was a little too acidic. The kids drank it but it is not something I'll make again in the future. My family loves this punch. Freeze in smaller quantities and it's a quick something to drink that is much healthier than pop! This was wonderful, refreshing and taste great. Definitely will make again. Excellent punch! We served at my grandparents 60th anniversary and was a smashing success! Highly recommended. We used this for a Bridal Shower and it was a hit! Everyone was asking for the recipe. Just the right mix of tangy and sweet.